There really are some amazing things to do in Lincolnshire. Head for the coast, take a walk through The Lincolnshire Wolds or explore the history and heritage of some of the ancient market towns. 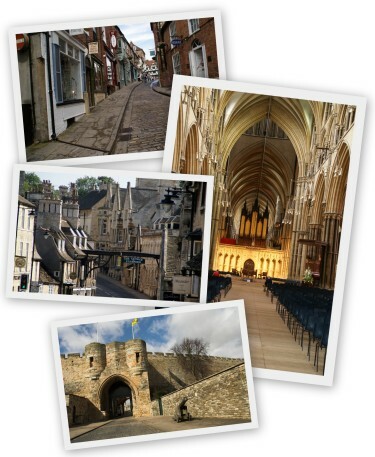 Lincolnshire tourism has so much to offer and such diversity it's simply a case of where to begin. Enjoy, explore and visit Lincolnshire! On the south west border of Lincolnshire is Stamford, one of the most beautiful towns in the UK and home to an extraordinary number of churches. The magnificent city of Lincoln is as impressive as anything you'll see in the UK. Dominated by its exceptional Cathedral a magnificent masterpiece of English Gothic architecture, Lincoln Castle built in the 11th century on top of a Roman fortress and the famous Steep Hill. You should visit Lincolnshire for these alone. The county's country houses are essential viewing. Try Burghley House, Belton House and Alford Manor House with reputedly the largest thatched roof in the country and nearby Gunby Hall has wonderful Victorian walled gardens, but isn't open every day so do check in advance. Also worth a visit is the Fishing Heritage Centre in Grimsby. And don't forget Grantham, the birthplace of one of the world's great scientists Sir Isaac Newton and the UK's most controversial politician. Tattershall Castle is a dramatic 15th century tower with a moat maintained by The National Trust and offers some great views across Lincolnshire. It would also be remis not to mention Boston and St Botolph's Church which rises from the flat agricultural land that shapes this part of the county. There's a fascinating history and it's a market town worth visiting. Wednesday & Saturdays are market days. The amazing Donna Nook Nature Reserve is one of the largest and most accessible breeding colonies of grey seals in the United Kingdom. November and December are the best times to visit to see the baby seals and weekdays are definitely quieter. However, do check the website before going as they generally keep this updated with seal numbers. There's the Natureland Seal Sanctuary renowned for their work with abandoned baby seals attracting thousands of visitors every year. Gibraltar Point National Nature Reserve, often referred to as Gib Point, is perhaps best known for its birds and the long-established bird observatory and ringing station. Some 214 species were recorded during 1994 and the total number keeps going up. If you're looking for a relaxing walk through a beautiful landscape with the chance to see some fantastic wildlife, RSPB Frampton Marsh is the place to visit with over 3km of trails around the reserve and three hides around the site for great, close-up views of wildlife. Don't miss the Museum of Lincolnshire Life. An extraordinary museum celebrating the culture of Lincolnshire and its people from 1750 to the present day. Highlights include a WWI tank, reconstructions of rooms in which locals worked and lived and interactive galleries of the Royal Lincolnshire Regiment. Also, if you're in Lincolnshire during May, you must see the Tetford & Salmonby Scarecrow Festival which generally runs over a weekend. You'll find the village filled with scarecrows of all shapes, sizes and themes. We've categorised everything to ensure it's easier to find. Also, for every attraction listed you'll find we've also listed other things to do nearby.You can browse everything or just take a look at those areas of interest.